Mads Mikkelsen (Doctor Strange, Rogue One) will star in the noir action thriller, Polar, set in the gritty underworld of political assassins. 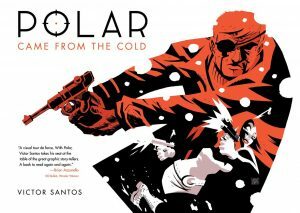 Award-winning Swedish director, Jonas Åkerlund (Lords of Chaos, Spun, Beyonce’s Hold-up, Lady Gaga’s Telephone) will direct this adaption of the acclaimed Dark Horse graphic novel Polar: Came With The Cold by Victor Santos, from a screenplay by Jayson Rothwell. Constantin Film’s Robert Kulzer (Resident Evil) and Bolt Pictures’Jeremy Bolt (Resident Evil, Death Race) will join forces with Dark Horse Entertainment’s Mike Richardson (Hellboy, Dark Matter) and Keith Goldberg (Umbrella Academy, The Legend of Tarzan) to produce, with Martin Moszkowicz executive producing. Mister Smith Entertainment announced that it is debuting the feature to international buyers at the upcoming 2017 American Film Market. The world’s top assassin Duncan Vizla, A.K.A the Black Kaiser (Mikkelsen), is retiring when his former employer marks him as a liability to the firm. Against his will, he soon finds himself back in the game, being hunted by an army of younger, faster, ruthless killers who will stop at nothing to have him silenced. Having no choice but to return to the shadowy life he thought he’d left behind, he must use his arsenal of deadly skills to outsmart his enemies, protect an innocent woman and redeem what’s left of his tormented soul.